Let us Leap was a weekend festival with a vibrant programme of visual art, music and literature selected and hosted by Hertford Arts Hub in partnership with Hertford Theatre, Hertford Library and The University of Hertfordshire. 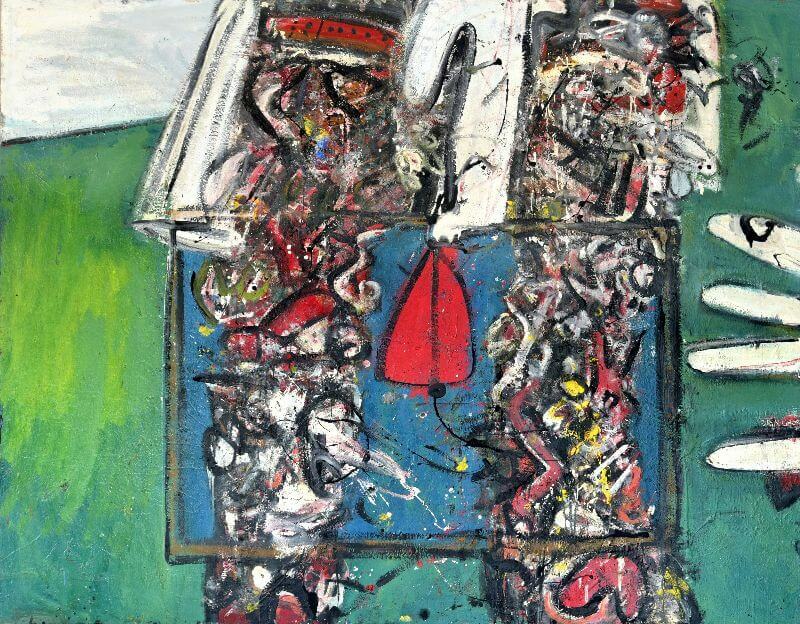 Open to everyone and celebrating the town’s art, culture and people, it takes its inspiration from the work of the British painter, poet and musician Alan Davie (1920-2014), who for over 50 years worked from his home and studio in nearby Rush Green. Let us Leap was a community-based festival in June to introduce you to Hertford Arts Hub. They hosted a vibrant programme of visual art, music, literature and educational activity to celebrate the town’s art, culture and people. This was inspired by the work of the painter; poet and musician Alan Davie (1920-2014) celebrated as the first twentieth century British artist to develop an expressive form of abstraction. For over 50 years he worked from his home and studio in nearby Rush Green. 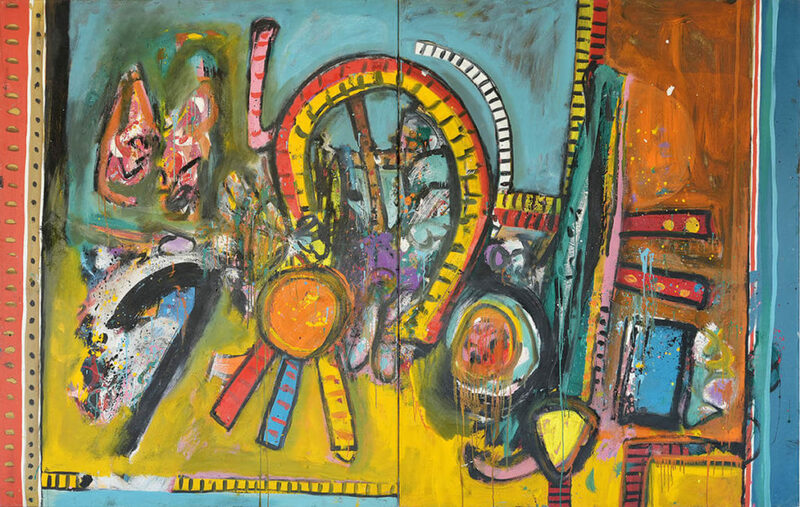 As well as making highly improvisatory paintings, Davie also practised as poet and jazz musician. Let Us Leap brought together contemporary artists and performers exploring creative expression in new and contemporary ways. We were quite stunned to welcome nearly 1000 visitors and participants to the weekend and so pleased to meet you at these events and Davie exhibition. We wanted to tell you that we are delighted, excited and slightly dazed that this show will be extended until late autumn. You will be able to experience what will become the new Hertford Arts Hub gallery with photographs, the architect’s model and of course the stunning artworks. The Exhibition traces the development of Davie’s practice over the last sixty years, highlighting particular moments in his visual journey. Loaned from the artist’s estate and White Hart Developments , it features seldom seen drawings and paintings whose kaleidoscopic medleys of gestures, forms and signs celebrate a world of imagination beyond the reality of the now. Harnessing the artist’s engagement with poetry, jazz and the art of ancient cultures, Davie’s images are the result of a highly improvisatory process in which the artist has combed his subconscious, allowing intuition to guide his responses. Drawn from a wealth of sources, they reach into our collective thoughts and feelings, bringing people together regardless of time, gender, race or background. 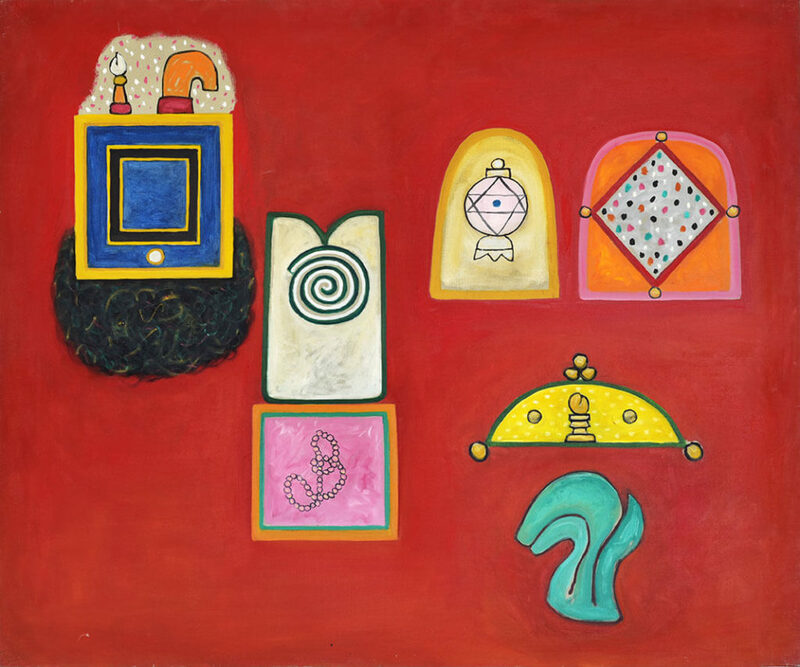 From his abstract canvases of the 1950s and 60s that draw attention to the materiality of paint and the physical gesture of the artist to later paintings that harness potent mystical symbols and text, Davie’s work demonstrates his commitment to art as a search for beauty that grows naturally with the rhythms of the mind and body. Helen Little is a curator and PhD candidate at the University of Hertfordshire currently researching Alan Davie and post-war British painting. 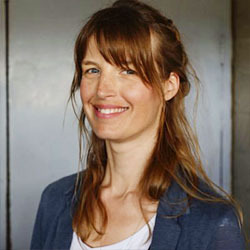 She was previously Assistant Curator, Modern & Contemporary British Art at Tate Britain where she organised major exhibitions of twentieth century British art including David Hockney (2017); Frank Auerbach (2015); Lowry and the Painting of Modern Life (2013) and Picasso and Modern British Art (2012). She is the author of Tate Introductions: David Hockney (Tate Publishing, 2017) and the online essay, Alan Davie Entrance to a Paradise (2014). 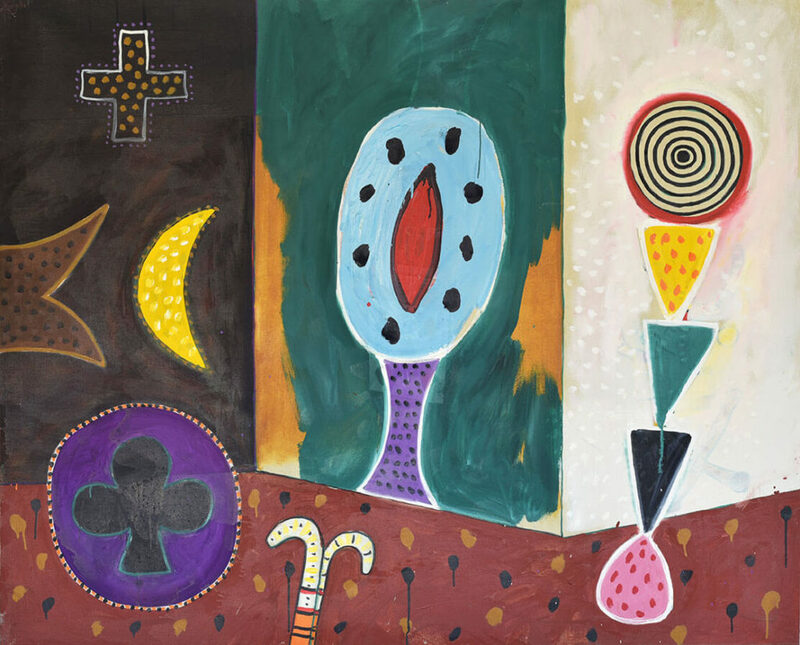 James Alan Davie was born in 1920 in the oil refining town of Grangemouth, Scotland, the son of a painter and etcher. 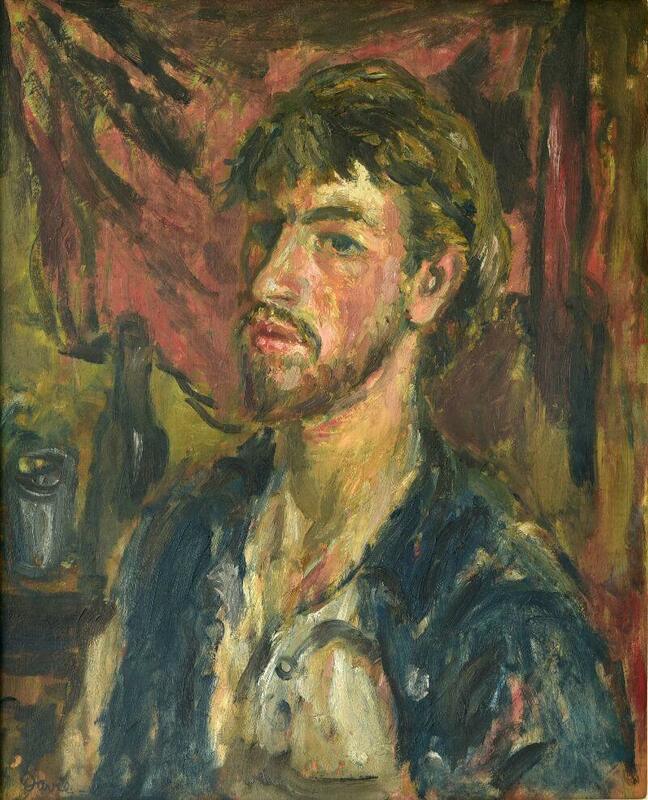 Although he painted a number of accomplished works as a teenager, this self-portrait is likely to have been made when Davie was a student at Edinburgh School of Art (1937-40). It reveals the influence of early twentieth century European painters including Cezanne, Degas and Van Gogh, who Davie had come into contact with through his father’s books. Yet in 1938, whilst browsing in an Edinburgh music shop, Davie encountered the American jazz tenor saxophonist Coleman Hawkins in an Edinburgh bookshop. Inspired to buy a saxophone, this marked the beginning of Davie’s interest in jazz music that would change the direction and style of his painting. 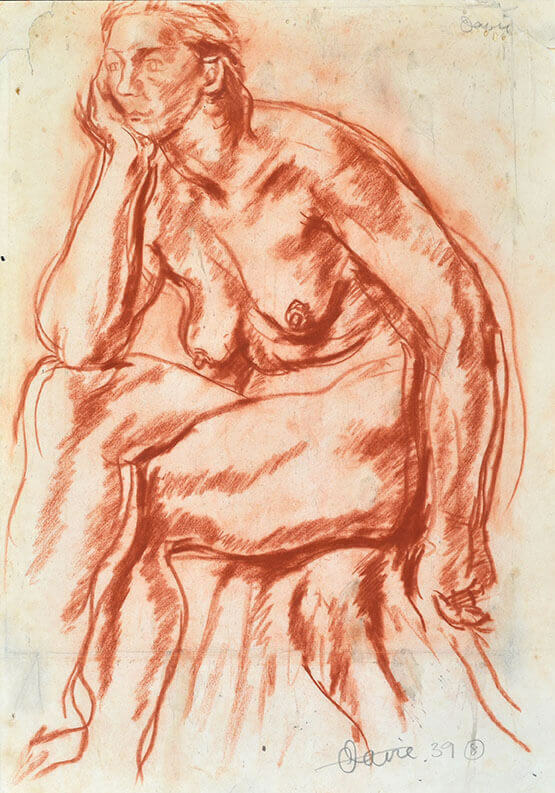 Although best known for his paintings with expressive brushwork, Davie was also a skilled draughtsman, as revealed in these life drawings made during Davie's studies at Edinburgh College of Art. After his war service in the Royal Artillery from 1941-46, Davie would reject making art from studying a model or motif in favour of creating images from the imagination. 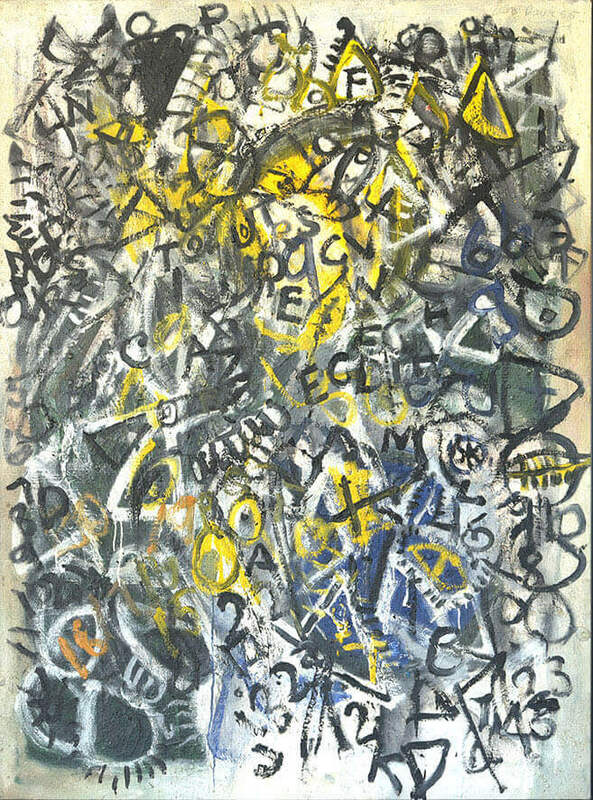 In the later 1950s and 1960s Davie's brushwork became more controlled and the imagery more legible as mysterious signs and symbols begin to appear. This painting was made the same year the artist discovered Eugen Herrigel’s Zen in the Art of Archery, published in 1953, which reaffirmed Davie’s ideas about art as a spiritual quest. His use of letters and numbers and poetic titles are typical in his paintings from this period and stem from his love of poetry, particularly the writings of Walt Whitman. An important aspect of Davie’s practice at this time was gliding, an activity the artist took up in 1960 and shared on many occasions with his friend, the artist Peter Lanyon. The stimulation Davie derived from physical activity and the natural world reveals a correlation between his collaboration with the elements through the act of letting go and the intuitive revelations in painting he believed were a vital life process. As in other paintings made in the 1960s, here Davie strove to paint spontaneously, without consciously deciding on the structure of the work. However, his paintings from this period still have a definite structure and often have similar features. Davie’s images took on a new direction after 1971 when the artist began spending part of each year living and working on the Caribbean island of St. Lucia. This enabled him to absorb visual aspects of other cultures and encounter cosmologies unfamiliar to the western world. Here Davie’s loose brushwork disappears altogether, the composition and handling more formally controlled and structured. 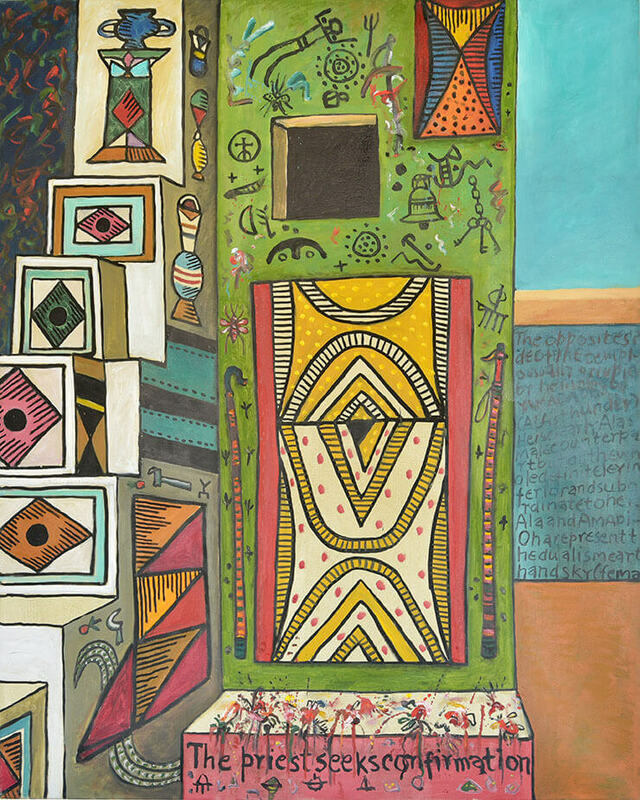 Like a number of modern artists of the early twentieth century fascinated with tribal art, Davie amassed an impressive collection of African, North-American Indian and Oceanic art that on several occasions was exhibited alongside his paintings. Music continued to play a vital role, Davie often playing improvised jazz in galleries showcasing his paintings. Since the 1990s Davie continued to work energetically, incorporating the visual conventions and myths of various exotic cultures into his art. There are six large oil paintings in this series, all dating from 1992. The central motif was derived from a book on African mud temples. Photographs of the temples showed murals and fantastic mud sculptures of figures with European hats, umbrellas, and even sewing machines, which the African artists presumably took to be potent symbols of some sort. The imagery around this is a combination sourced from Mexican and Aboriginal art as well as that from the artist’s imagination. The text appearing in the series is a mixture of English, Spanish, and French sourced from books on alchemy. Davie’s images took on a new direction in the early 1970’s when the artist began spending part of each year living and working on the Caribbean island of St. Lucia. This enabled him to absorb visual aspects of other cultures and encounter cosmologies unfamiliar to the western world. 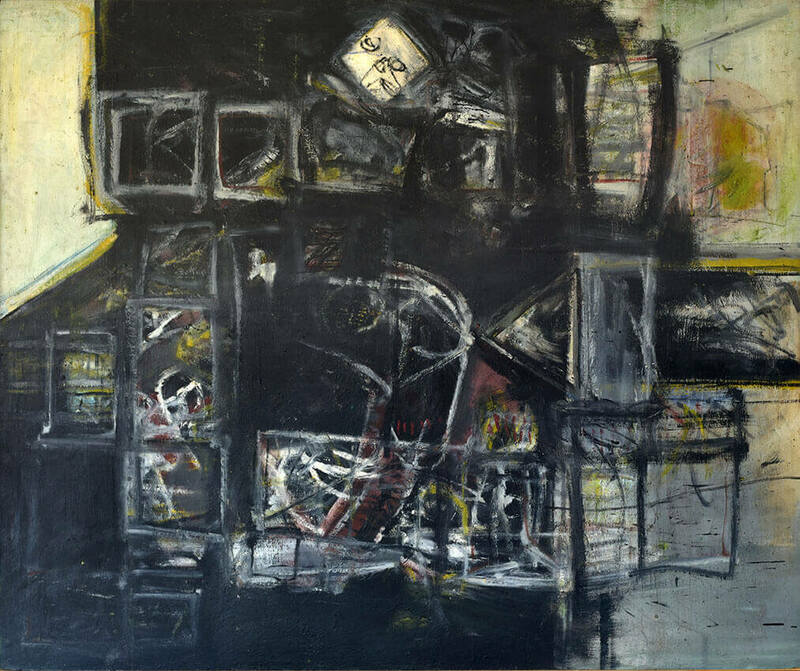 Working quickly with boards and canvases packed around the walls and floor of his studio using large brushes and pots of paint, Davie’s paintings from the 1950s were produced without any consideration for subject or form. The artist discovered that images appeared to him in moments when he was taken by surprise and ‘enraptured beyond knowing’.